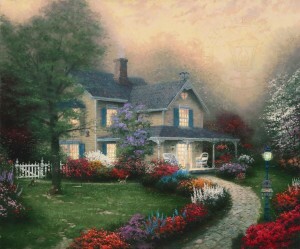 Mr. Kinkade, it is a pleasure to connect with you to tell you how much I enjoy all your works of Art. You have indeed been blessed to have such a gift. God, knew the gift he bestowed on you would allow the colours of Heaven to be viewed to those of us who may, or may not have the privilege to enjoy this beauty, when we pass over. Your art draws me in, as if I were still a curious school girl seeking hidden treasures. The choice of colours in your pictures, opens the eye to all the other beautiful affects in your art. Being from the Maritimes, Cape Breton, and grew up surrounded buy water, your scenes of the ocean and the lighthouses make me homesick. I have been living in Edmonton, Alberta, Canada since 1979. There is no guessing what your art is telling us, but it is said with such power, those who stop to admire your works, can feel the action or peacefulness of the piece. Thank you, for making my life much more colourful and a touch of what Heaven has in store for those of us who received God’s Given Gifts and shared them.